Join me in October for five days of all-out photography in one of America's most beautiful national parks. 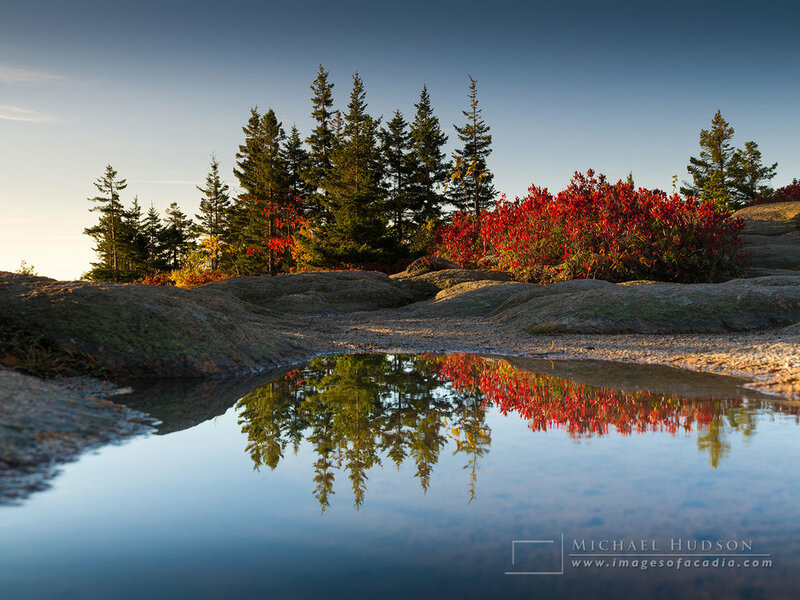 I'll be taking you to many of my favorite places in Acadia, as well as giving you personal tips and instruction to help improve your photography skills. We'll visit all the most iconic places in Acadia, as well as some lesser known spots– I've been photographing Autumn in Acadia since 2006 and know my way around the park better than most. The second to third week of October is always the best time for fall colors and if you've never been to New England in autumn, you're in for a real treat. One of the things last year’s participants told me was they wished the workshop was longer, so this year we’ll be doing five days instead of four now. Along the way, I'll also be teaching you landscape photography– about light and how important it is, choosing the right lens for any given subject, using your camera in full manual mode to create better, artistic images, working with whatever weather we're given, essential and non-essential gear and more. We'll be rising early every morning to photograph the sunrise (which is around 6:50am) in a different part of Acadia each day, then heading back to the hotel for breakfast. Afterwards, we'll head out again for more photography, break for lunch, then shoot some more until after the sun goes down around 6pm. When the photography is done, we'll head into the small town of Bar Harbor for dinner together before calling it a night and getting some sleep, then doing it all over again the next day. For those that are interested, after dinner I can show you how I process my photos in Lightroom and Photoshop and prep photos for printing, websites or social media. This isn't a really strenuous trip, but you should be in good health and able to climb over the rocks and boulders along the Atlantic coast (Acadia is on an island so there's plenty of coastline for us to photograph), as well as some moderate hiking in the woods and on trails. Many of the locations we'll be visiting are close to the road so there shouldn't be lots of hiking involved, but we will hopefully be doing some hiking to photograph some of the vistas. Bring sturdy hiking boots and warm clothes. Acadia can get cold in the Fall, though it can warm up nicely during the day too. As we get closer to October, I'll send you tips for what to pack, what camera gear I'm bringing (to give you an idea of what to bring, and what not to bring), and more. The cost for this photo tour will be $2100. This will include all excursions, instruction and transportation to each location. It also includes accommodation at my favorite Bar Harbor hotel, just minutes from the national park. I'm one of the few photographers to include accommodation and transportation in the price, so if you're comparing workshops, make sure you add the cost of a hotel and transportation during the workshop to the price you're quoted. You would need to cover the cost of any lunch and dinner each day, transportation to Bar Harbor and any other incidental expenses. I may be able to pick up some of you from Bangor airport (an hour away) on the first day and drop you off there again on the last day... stay tuned. I want this to be the trip of a lifetime for you, where you get to spend several days in a beautiful part of the country at a beautiful time of the year, learning about photography and growing your passion for landscape photography, and enjoying the company and camaraderie of other like-minded photographers. Check out images made by some of the photographers who attended the workshop in October 2018. Registration for 2019 is now open. If you're interested in joining us and would like a registration form, please fill out the form below. Thank you! I'll email you a registration form shortly. Michael Hudson has been a professional photographer since 1989. He is the author of The Photographer's Guide to Acadia and Under October Skies (Autumn in Acadia), which is sold in the Acadia National Park visitors center. His image of sunrise at Hunters Head was chosen to be on the current Acadia annual visitors pass. He's passionate about Acadia and teaching others to enjoy the outdoors through photography.